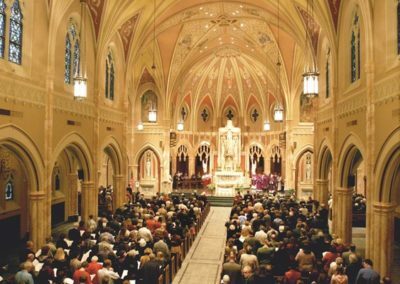 As Blessed Sacrament Catholic Church neared it’s seventy-fifth anniversary, it was an appropriate time to address the care and renewal of this beautiful, but aging, building. 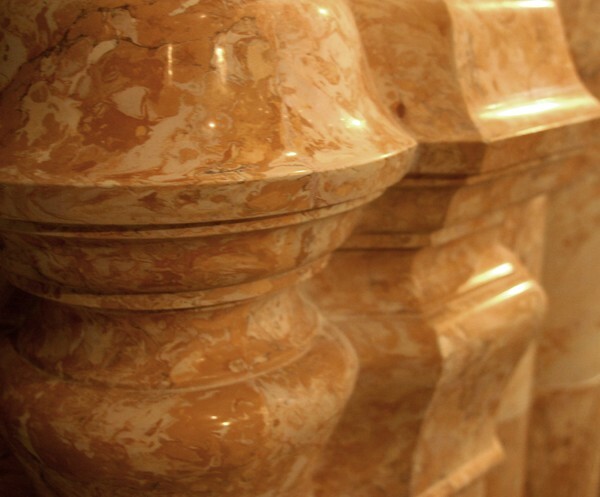 The roof required repair, the interior was dark and dirty, and the scagliola columns were severely yellowed. 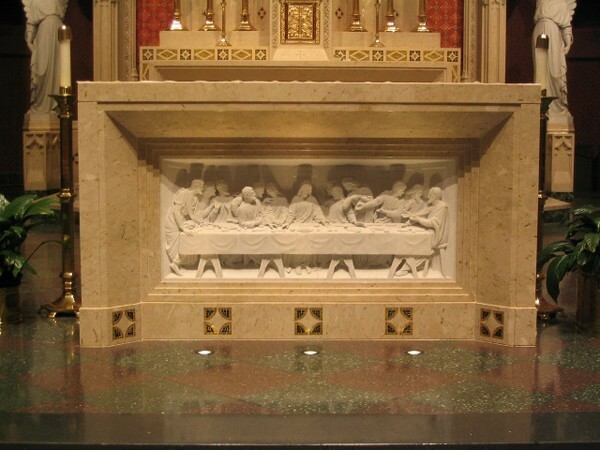 Many updates were needed to meet the desired changes in the liturgy, as well as to allow the church to be a comfortable, accessible and inviting place for prayer and worship. 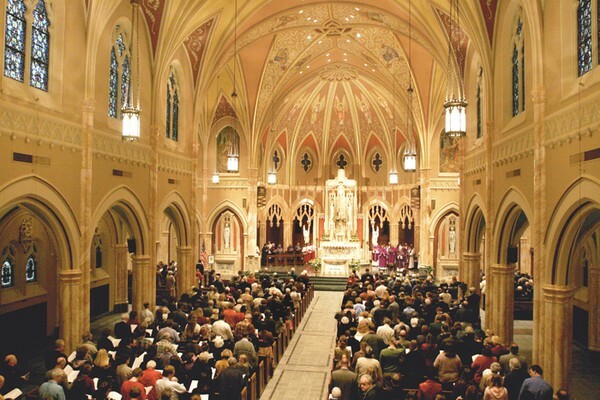 First dedicated on Thanksgiving Day, November 27, 1930, Blessed Sacrament Catholic Church in Springfield, Illinois, celebrated its rededication on the same day, seventy-five years later. The extensive restoration included every inch of the church, from the new porcelain-tiled floor to the Gothic-vaulted ceiling. 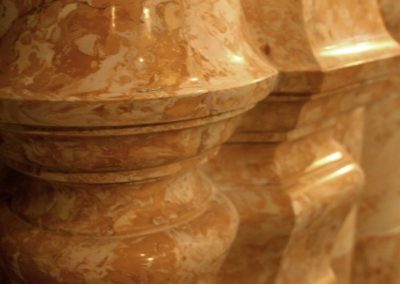 The severely, yellowed scagliola was meticulously restored by CSS artisans to bring back the original colors and luminosity. The renewed scagliola became a major component in recreating the decorative scheme that was based on the original colors and decorative patterns. A new palette of soft, warm tones was applied to the walls, ceilings and moldings. Original stencil patterns were replicated. 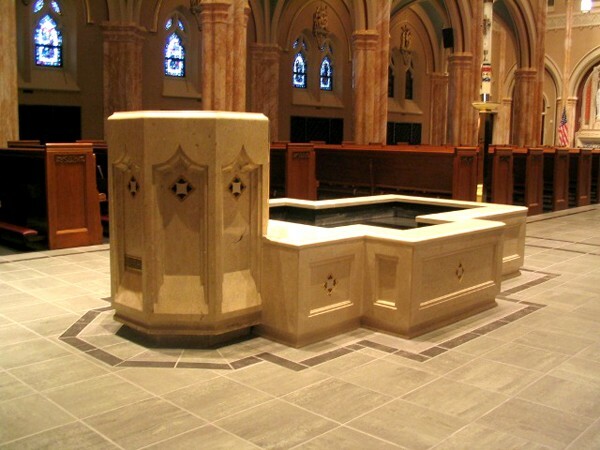 The original baptismal font was relocated to the entrance to the church and combined with a new immersion font that complimented the original font design. 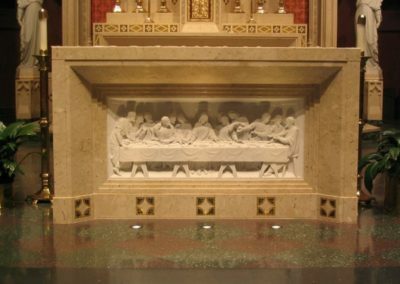 A new altar was designed by CSS and created in Italy in a style to match seamlessly with the existing Botticino reredos and side altars. To increase comfort and accessibility, the pews were removed, refinished and reinstalled and a ramp to the sanctuary was added. 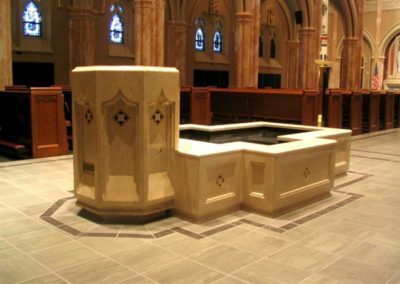 The newly restored church demonstrates the commitment of the parish of Blessed Sacrament to strengthen and renew their own faith and preserve the grace and beauty of their church for future generations.